Several Anthurium species have started to become quite trendy as houseplants of late, tending to appear more frequently in many shops and nurseries. 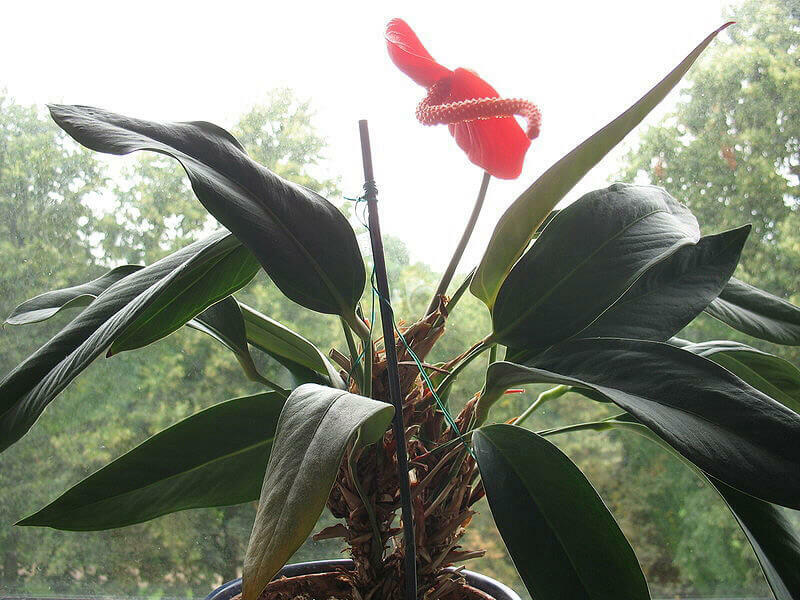 Anthurium's are not the cheapest houseplants you can purchase, especially if compared with the other indoor plants you'll find stocked next to it. However despite the price tag they're certainly exotic and striking and arguably well worth the money. 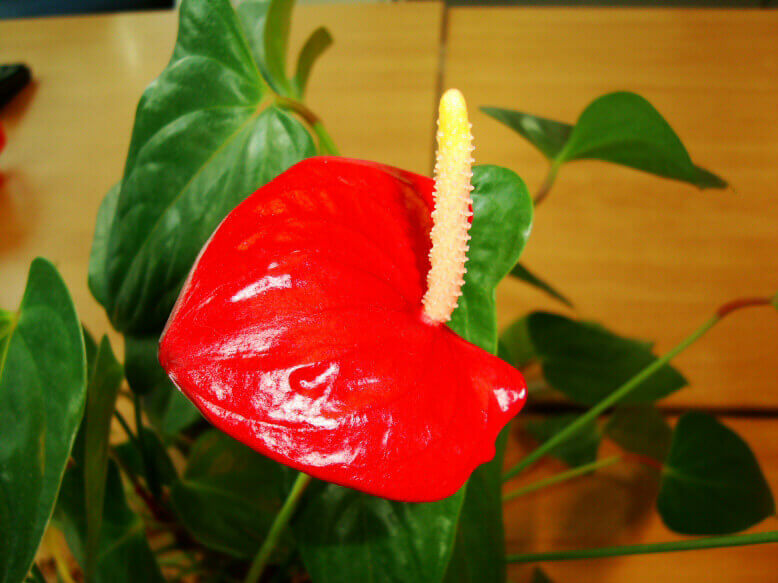 The flowers are long lasting and it's not unusual for an Anthurium to be in almost continuous flower. With the bright waxy tough flowers hovering above the contrasting dark green leaves for months on end they're good value and certainly have many fans. Plants belonging to the Anthurium family in general come from the tropical regions of South America and so thrive in warm and humid environments. 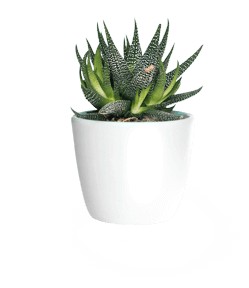 This is not the natural environment in our homes or places of work so these plants are normally difficult to keep as houseplants, therefore you will typically only find two species which are sold as houseplants. Both types are fairly accommodating of indoor environments, although even then they can be tricky, but if you've had general experience with houseplants (or are keen to learn) you should be fine. The two you will likely come across are Anthurium Andreanum and Anthurium Scherzianum. This is the more difficult one out of the two, but funny enough the Painter's Palette is the easiest one to find in shops. It has arrow shaped and highly polished leaves with an almost unreal looking appearance, which may get people wondering if the plant is genuine or artificial. 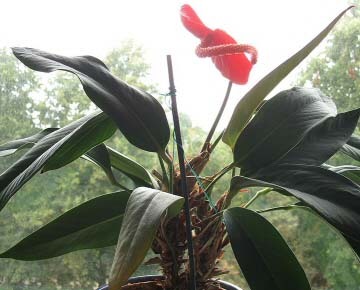 The leaf or spathe surrounding the flowering spike is normally red, cream or purple but either way the flower spike itself is always straight (picture above at the start of the article). You may struggle to find the A. scherzianum hybrid (pictured right) aka the Flamingo Flower but if you prefer it over A. andreanum then it's obviously worth the search. 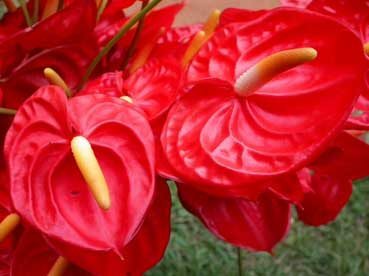 Both plants are very similar except the Flamingo Flower has different shaped leaves, being longer and more slender. The flower spike is also curly rather than straight and usually the same colour as the spathe whereas the Painter's Palette has a straight spathe which is typically yellow or white. Providing they're in flower, this is therefore the easiest way to tell the two varieties apart. The final visible comparable difference is that the Flamingo Flower is often more compact than the Painter's Palette. Good light is needed for all Anthurium's, but you should avoid direct sunlight otherwise the leaves will go brown and crispy. Anthurium's don't like dryness at the roots, but occasional experiences of this won't be a deal breaker. For best results use tepid soft water and try to keep the soil at least slightly moist at all times. The plant will need a reasonable level of humidity in order to thrive. The majority of homes should be suitable but if you've very dry air, regular misting will help, in addition to helping prevent dust from building up on the leaves. 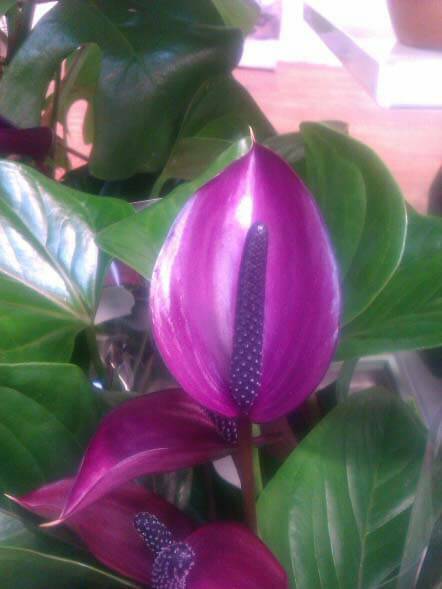 Anthurium's require warmth and if you're providing this it will grow all year round. This means regular gentle weak feeding all year (if it's actually growing) would definitely be helpful, in order to provide a continuous supply of nutrients. Assuming you're feeding, anything from once a month or once every couple of months is a good choice. 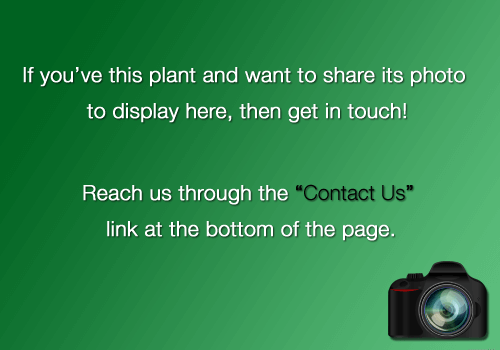 This plant must have warm temperatures, so choose your plant's location carefully. No lower than 16°C / 60°F and for good growth 20°C / 68°F plus. If you can't meet the minimum temperature requirement all year round then ease up on the watering and feeding when it gets colder. Look to repot your Anthurium every couple of years in Spring if it's needed. When it comes to the potting medium no special requirements are needed, normal potting soil or houseplant compost is completely fine, although adding small amounts of bark or perlite to the mix will be beneficial and help prevent drainage problems. You can remove any offsets that have grown when you repot your plant. However the primary reason Anthurium's are so expensive is because they take a long time to grow into an attractive looking sized plant. So bear this in mind if you are attempting to expand your collection through propagation as it could be some years before the offsets start flowering. 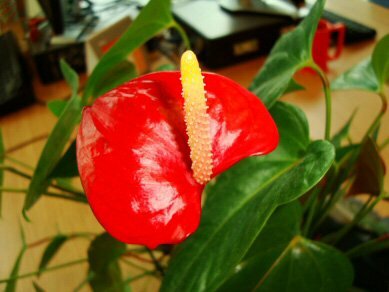 Anthurium's don't grow particularly fast, but if all the care requirements are met you'll still notice the plant growing. After many years the Painter's Palette can get quite large at 60cm / 2ft in in both height and spread, where as the Flamingo Flower is often smaller at around 40cm / 16in. The flowers on Anthurium's are unique looking and often give a long lasting splash of colour. If a constant warm temperature is achieved then flowering can occur at anytime of the year, if not then expect the waxy vibrant flowers to appear between February through to September. 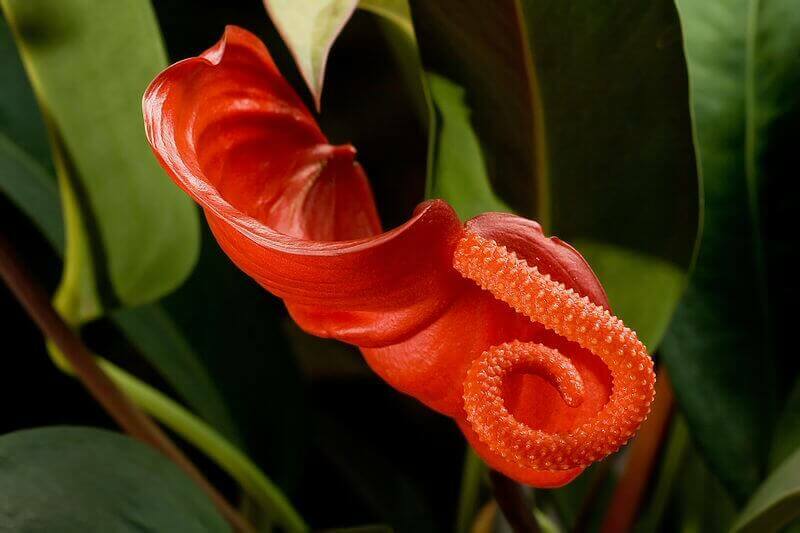 There isn't any special trick to get the flowers, if you follow the Anthurium care tips they will come in time. This is another houseplant which contains calcium oxalate crystals in the leaves and stems. Whilst rarely fatal it can be very unpleasant when chewed on. Keep your pets away if they're the nibbling types. 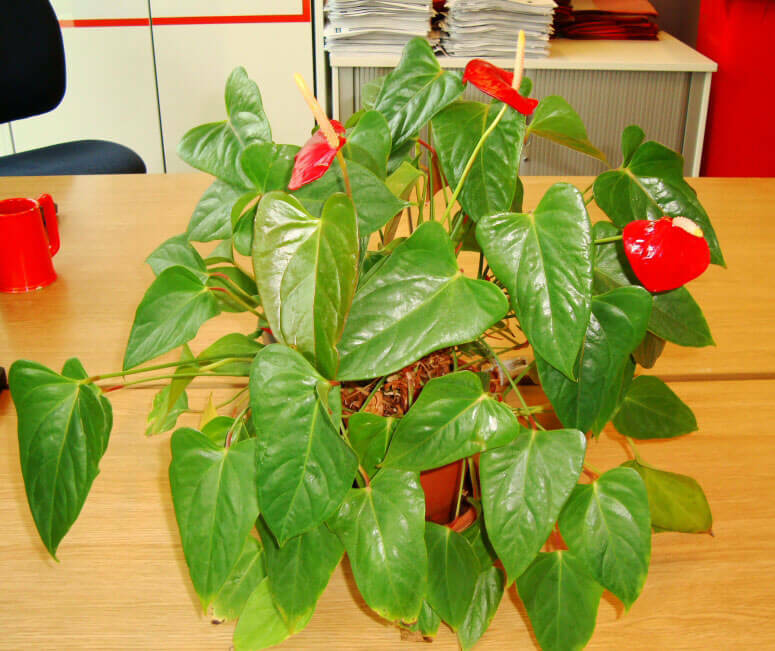 The Painter's Palette and Flamingo Flower can make great plants for the work office. The majority are air conditioned or heated to maintain a consistent temperature all year round, this combined with good light means optimum growth and flowering potential. Often caused by poor watering technique, i.e. not keeping the soil moist. Another common cause is that the humidity is too low or the light levels are too bright. This is usually a result of overwatering your plant. The soil should be moist rather than saturated. If you know you struggle to get watering right, then mix in some perlite or small bits of chipped bark to aid in drainage. You can either squish the Aphids with your fingers by gently running them up and down the stem where the colony has set up home. Or spray with a spray mister containing 9 parts water to 1 part washing up liquid / liquid soap. Your Anthurium plant will only produce flowers if it's happy. Warm temperatures, moist soil and reasonable amounts of light are needed. The plant will also need feeding from time to time. Be warned that it will also dislike you if the temperature fluctuates wildly, i.e. very warm during the day swinging to cold temperatures at night. Try and fix all these problems and you'll get the flowers.